Inspired by their search for a durable and timeless schoolbag, The Cambridge Satchel Company was founded in 2008 by mother and daughter duo, Julie and Freda Deane. Starting with £600 and growing to £13m turnover, the company now manufactures well over 3000 bags per week (source: The Guardian). 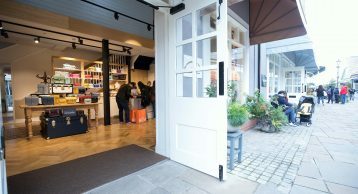 What better location to host such a brand than Bicester Village – hailed as the ultimate shopping destination and home to some of the most luxurious brands in the world. 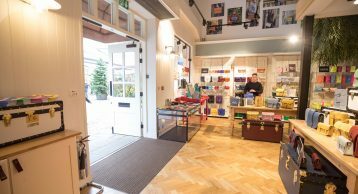 “We wanted to create a unique Cambridge Satchel Company experience for the visitors” said founder and CEO Julie Deane. From the ‘Instagram Moment’ wall to the iconic Cambridge punt, everything about the brand speaks quality and heritage. Maintaining these brand values is paramount for such a company and this starts with the first impression made as the customers walks into the store. 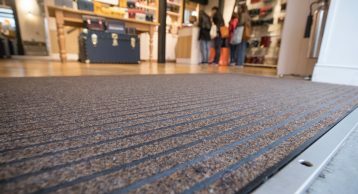 At INTRAsystems we believe in the power of first impressions and how Entrance Matting supports this. Our INTRAform Low Profile Entrance Matting with a black anodised finish works in harmony with The Cambridge Satchel Company brand. 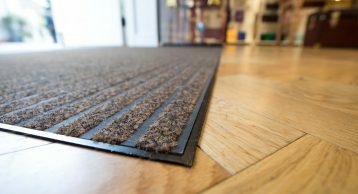 Combined with our INTRAlux Elite Coco fibre insert made with a 100% recycled Econyl yarn, a highly durable system is formed that prevents the ingress of soil and moisture into the store, to keep the internal finishing clean and safe for all customers. 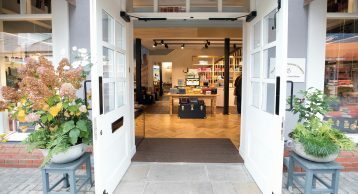 The Entrance Matting for The Cambridge Satchel Company was specifically designed to blend with the internal aesthetics to enhance the reception area, further accentuating the traditional Cambridge Boat House feature, built as a mezzanine within the space. Much like the ability to personalise your own Cambridge Satchel Company bags and accessories, our Entrance Matting too offers endless personalisation; from an anodised aluminium finish, to the various coloured inserts, to the size of the profiles. Keeping customers safe, maintaining the internal aesthetics and reducing their cleaning costs are essential considerations for all retailers. By installing the right Entrance Matting, all this and much more can be achieved. By partnering with INTRAsystems, you can make a lasting first impression and add to your brand presence without compromising on function. 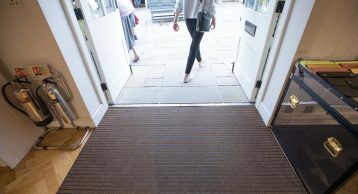 Next time you are in Bicester Village, why not check out our Entrance Matting in action!